Ryan Larson and I have a piece in the current issue of Contexts about last year’s extraordinary season in the English Premier League (EPL). 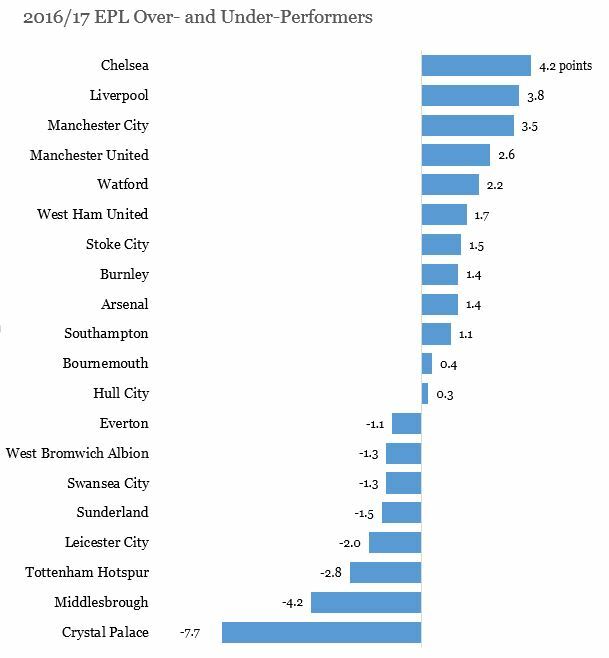 In short, the last season longstanding correlation between wage spending and points in the table fell apart. And it wasn’t all explained by Leicester City’s astonishing title run or Chelsea’s inexplicable post-title collapse. It also wasn’t just a matter of some lucky goals here and there. Last year was weird and awesome. As we say in the article, “Given such irrational spending, we might have imagined that the wealthy clubs would learn a lesson and curb inefficient wage spending in 2016/17. If anything, the opposite happened: the wealthy teams doubled-down on the strategy of buying their way to wins.” So, what happened? At the current moment, we’re just past the midway point in the season (20 out of 38 games played). This year, it does looks like a billionaire can buy his club a position near the top of table. The six clubs that spend over £100 million in wages occupy the top six spots. 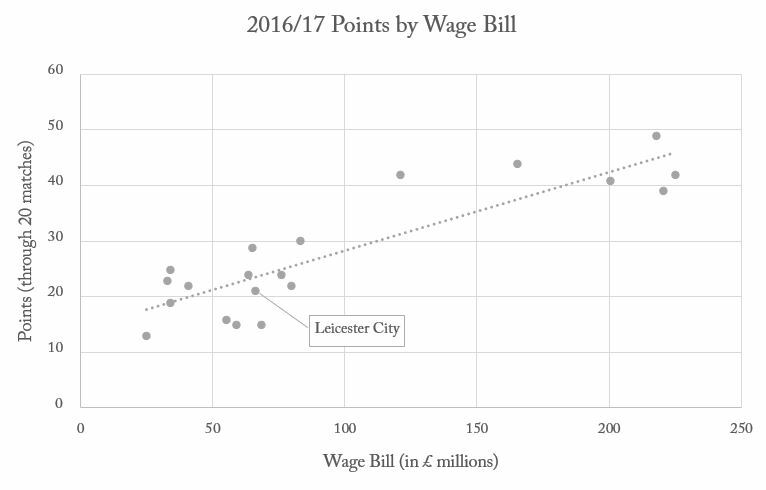 Leicester City, the plucky heroes of last season, is performing almost exactly how you would expect given their spending. This year, then, is about what we should expect most years in a league with such extreme inequality. What about “luck” this season? Four of the top title challengers have eked out a few more points than we’d expect given their goals for and against. Crystal Palace, who sit in 17th place, haven’t been able to turn their 30 goals into more than 4 wins and 12 draws. But fifteen of the twenty teams are within one win’s worth of the points we would expect, so it’s not a particularly lucky or unlucky season. If last year was exceptional, this year has been terribly predictable.